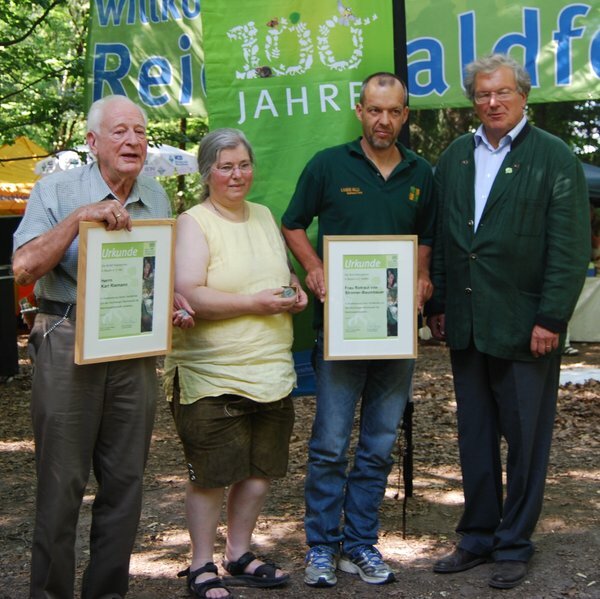 In 2013, the "Bund Naturschutz" BN (the German nature conservation association) had its 100th birthday. At the same time the 40th "Reichswaldfest" was celebrated. In addition to those important events all friends of the forest could celebrate "300 years of sustainability". The BN took this opportunity to honour the administrator of the "Stromer Trust" with the "Reichswaldmedaille" (Imperial Forest Medal) and a document for her "credits in preserving the Reichswald of Nuremberg". Together with the administrator, Karl Riemann (in the picture on the left) obtained the same important distinction for his indefatigable work. For the common photograph the administrator had invited the trust's forester, Burkhard Reuter (in the picture second from the right). Without his continuous hard work, partially on a voluntary basis, she would not have received this distinction. Our forest is the southernmost corner of the "Lorenzer Reichswald", FFH (Fauna Flora Habitat) area since the year 2004. As we know from reliable sources, this is the kind of distinction most delighting the administrator.